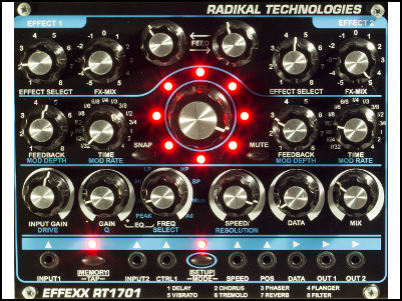 Radikal Technologies (GER) was founded in 1995 as a distribution company for professional studio equipment. In 1999 Radikal started with the development of their own designs. In 2004 the Spectralis Hybrid Synthesizer hit the market. The most powerful synthesizer and sequencer instrument ever shortly became one of the most sought after live and studio tools of the world. The Spectralis II and the Accelerator Keyboard followed, providing an even more unique and robust sound palette for musicians to experiment with. Now, Radikal is back to innovating in the Eurorack market with their versatile, experimental, and powerful Swarm Oscillator and EFFEXX module.